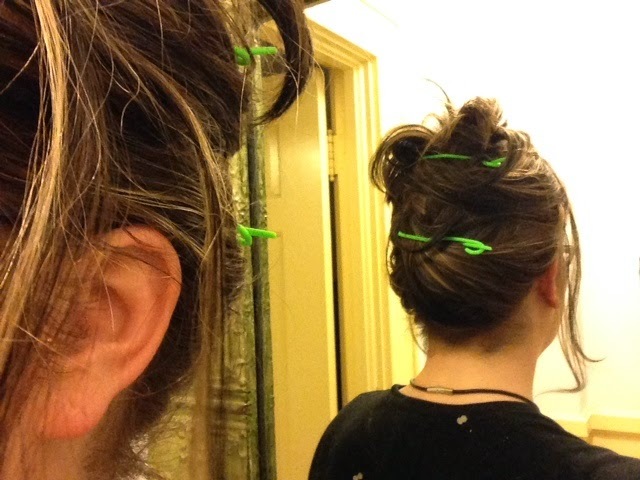 Day 277 - Friday Fail: Diameter-is-not-radius edition, with Customizable Power Hair Clips! 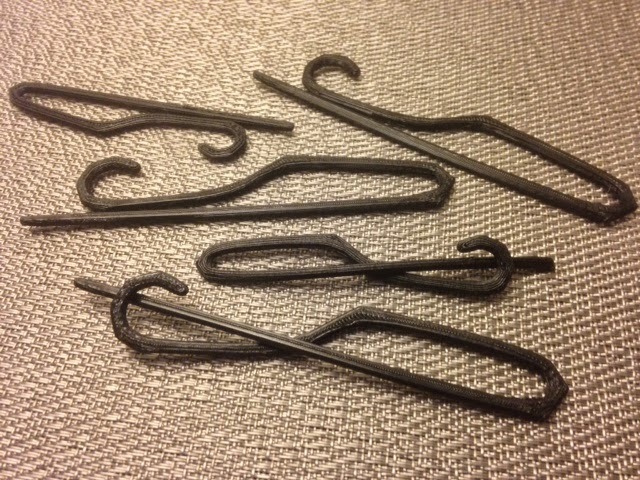 As you can see, today we printed some power hair clips. Welcome to a special Ladies' edition of Friday Fail! 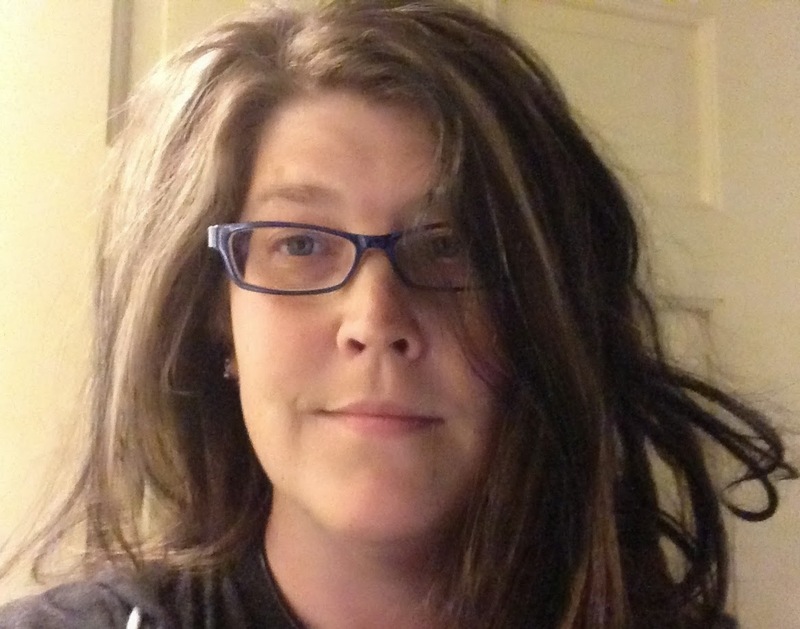 To illustrate why custom hair clips might be necessary I am going to break a personal rule and show you a picture of myself. Note the mountain of unreasonable hair. It's impossible to tie up with regular barrettes and clips. It does not obey. Anyway, today I designed a power hair clip that can tame even my monster hair. The design is based on an old clip of mine that sort of worked for a while and now I can't find anywhere. 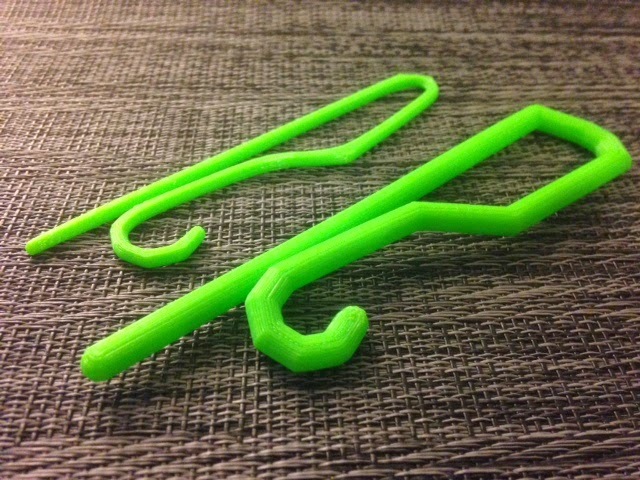 These power hair clips were made in OpenSCAD with some mesh management in TopMod afterwards to smooth them up a bit. 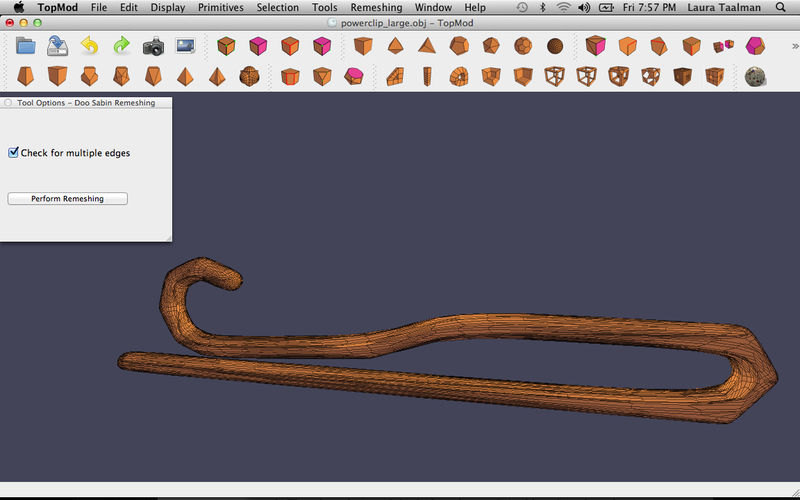 Since your hair isn't my hair, I also put a parametric OpenSCAD model on the Thingiverse Customizer so you can eshakti it up yourself. Settings: Printed on a MakerBot Replicator 2 on .3mm/low setting. Raft is not strictly necessary even over tape-on-glass, but if you're going to print multiple copies at once and your platform doesn't level completely then I recommend a raft. Technical notes, trig flavor: There is some nice basic trigonometry in the construction, specifically this: If you want to make some coordinates around a circle, use the fact that each point on the circle can be expressed as (r*cos(angle),r*sin(angle)), where r is the radius (RADIUS NOT DIAMETER) of the circle and the angle is measured between the positive side of the x-axis and the line from the origin to the desired point on the unit circle. See Math Open Reference for more details on the math involved. 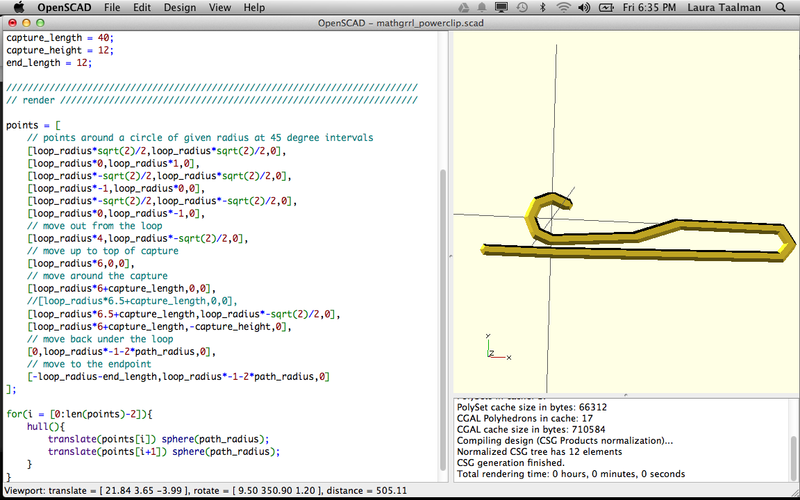 In OpenSCAD angles are measured in degrees instead of radians which can be kind of a pain, so instead of using the OpenSCAD sine and cosine functions I just computed the trig values myself; for example cos(45 degrees) = sqrt(2)/2. The first six points in the code below are around a circle of radius loop_radius, and the remaining points trace out the clip itself.